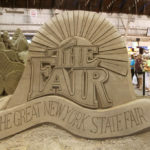 Fair Attractions - The Great New York State Fair! to see new attractions, old favorites and have timeless fun! The Daniel Parrish Witter Agricultural Museum just celebrated it’s 90th anniversary at the Fair! Open since 1928, the Agriculture Museum shows the history of agriculture in New York State, and in turn the history of the state itself. 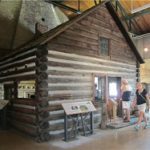 This includes within its walls an actual, fully furnished log cabin from the area’s homespun days. More than that, the museum’s exhibits, coupled with demonstrations by local craftspeople, let you experience what New York farm life was like in the 18th century. Further emphasizing that history is the Carriage Museum, which features more than 50 horse-drawn vehicles and a blacksmith demonstration. Both are open daily from 10:00am to 8:00pm. 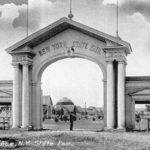 Agriculture is New York State's largest industry and it has been the foundation of the New York State Fair since its creation in 1841. 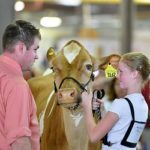 Each year the Fair receives approximately 40,000 entries for agriculture-related contests including competitions that feature 10,000 of New York's best cows, horses, goats, pigs, llamas, sheep, poultry and rabbits. 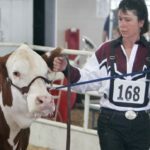 You can tour the barns and talk to the families who bring their award winning animals to the Fair for competitions. 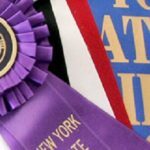 You can also check out the thousands of other impressive agriculture related entries that are submitted by young people throughout New York State and highlighted in the 4-H Youth and FFA buildings. Judging occurs daily in the Horticulture Building, all the livestock barns, the Toyota Coliseum, and the 4-H & FFA areas. Learn about New York’s agricultural heritage through this fascinating collection of antique farm tractors. Most of these machines have long retired from the field and were produced before 1960. Most have been restored; some to better-than-new condition. 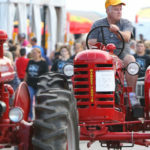 The tractors are on exhibit every day of the State Fair in their new location across from the Beef Barn on the corner of Broadway. These animatronic dragons take stilt walking to the next level with wing spans of 9 feet, sounds and life like features! The Arch Dragons will make their daily appearances in the area around the Talent Showcase near the Youth Building. Thursday, August 29 is Armed Forces Day and will, as always, honor the contributions of those who served and who made the ultimate sacrifice in defense of our country. Make sure to attend the Armed Forces Day ceremonies at 11:00am at the Veterans Memorial. 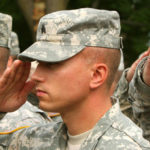 Join the State Fair community as we honor and give tribute to all members of our Armed Forces. 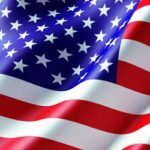 Armed Forces Day allows free admission to any active duty or veteran with military identification (Military ID Card, form DD-214 or NYS Driver License, Learner Permit or non-driver ID card with a veteran designation). From fine arts and photography to homespun crafts like quilting, woodworking and needlepoint, work created by some of New York’s most talented artists will be on display and competing for ribbons and prize money. Located in the Wegmans Art & Home Center. 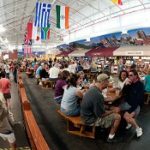 This is the home of culinary demonstrations, photography exhibits, arts and crafts, a variety of entertainment and much more. Listen to organ recitals in the Empire Theater; sometimes as dramatic accompaniment to screenings of old, silent films. For more musical history, go to the Empire State Theatre & Musical Instrument Museum. You can also enjoy a beverage in air-conditioned comfort at the Empire Room Bar. 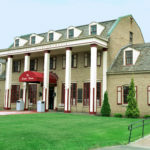 Wednesday, August 28 is Women’s Day at the 2019 New York State Fair with the annual Women’s Day Luncheon, sponsored by St. Joseph’s Health, being held in the Empire Room at noon. In addition to the luncheon, many special events have been planned throughout the building. 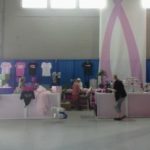 During the entire day, various women’s advocacy organizations will be at a "mini-fair" set up in the Chevy Court Pavilion. Be sure to visit the Wegmans Demonstration Kitchen and the Empire Theater for more events. Please call (315) 487-7711 ext. 1265 with questions or for more information. Come celebrate the beef industry on Tuesday, August 27 with the New York State Fair and the New York Beef Council. Visit the Dairy Products Building to see hundreds of pounds of butter turned into art to mark the 51st anniversary of this State Fair tradition. For the visually impaired we also have a hands-on clay model of the butter sculpture at the Dairy Princess Booth. You can also see blocks of New York State cheese carved into artwork before your eyes. Make sure to check out our Dairy Day daily schedule for Thursday, August 29. 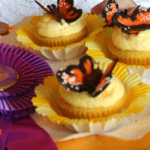 The state’s best pies, cakes, jams, breads and other homemade goodies vie for ribbons in this traditional, county fair competition. 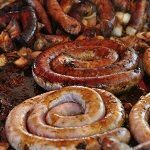 Less traditional contests include chicken wings, chili, Spam dishes and fried food on a stick. Located on the first floor of the Wegmans Art & Home Center. 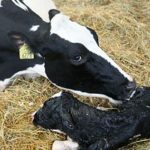 Returning this year is an opportunity for fairgoers to witness first-hand the miracle of life daily by watching a dairy cow give birth to a calf. 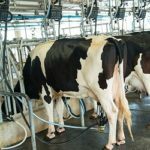 The New York Animal Agriculture Coalition is providing this opportunity for the public to learn more about the dairy industry, the care farmers provide their animals, as well as the birthing process. View a 24-7 live stream of the Dairy Cow Live Birthing Center. Located now in its new location in the Family Fun Zone near the Youth Building. 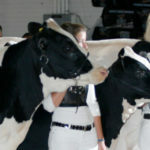 Come celebrate the dairy industry on Thursday, August 29 with the New York State Fair and New York dairy farmers. A moo-moo here, a moo-moo there that's the only way to describe the home of everything milk and dairy at the Fair which is meant to highlight the importance of the dairy industry within New York's farm economy. 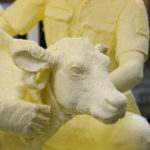 While there you can check out the world famous butter sculpture made from 800 pounds of creamy New York butter, have a 25¢ glass of cold white or chocolate milk, sample delicious cheese and yogurt, or have a yummy in your tummy milk shake. 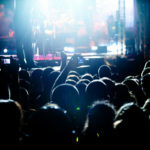 Thirteen days of entertainment will be featured on the Experience Stage on the western end of the Fairgrounds in the New York Experience Festival Grounds. Several national touring acts, along with a mix of major bands from across Upstate New York and national touring tribute bands, will make up a diverse lineup of talent and entertainment - all free with your Fair admission. The stage will also host bands for the new Latino Village Weekend and the returning Syracuse JAMS FunkFest. There is certainly something for everyone to experience... at the Experience Stage! Family Fishing Days will be on Thursday, August 22 and Saturday, August 24, presented in cooperation with the state Department of Environmental Conservation. Admission is free for anyone presenting a valid New York State hunting or fishing license at the gate. The DEC will operate free fishing clinics in the pond in the New York Experience festival grounds on those days. It’s a feast for the eyes and heart burn for the stomach with every kind of food available... from the donut burger, to the long john donut hot dog dipped in maple syrup, to deep fried macaroni, candy bars and vegetables of all kinds. Of course, you cannot forget the world famous State Fair sausage sandwich with onions and peppers. You better come to the Fair hungry because leaving full is the only option! Join us the evening of Saturday, August 24 and all day Sunday, August 25 for the Fair's traditional Gospel Music Weekend of uplifting music and joyful voices at the Talent Showcase stage. 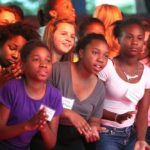 The New York State Fair Youth Gospel Choir and several other groups and choirs will help keep the good news and good music flowing on the Talent Showcase Stage. The Hall of Health in the Science and Industry Building is the Fair-time home to a wide variety of health service organizations and professionals. Learn about helpful programs you can take advantage of and potential health problems you may be unaware of. Each show with Hilby is best described as one without boundaries! 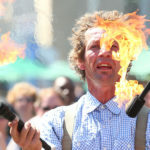 While being an expert in juggling all sorts of objects and subjects as well as countless circus and variety skills (such as unicycling, ropewalking, unsupported ladder, fire manipulations and eating, balancing stunts and the list goes on and on), he really gets his audience involved and creates magical and hilarious moments through their participation. Watch out for catapults, marshmallows, lots of Velcro and the bowling-ball of terror. Hilby has training in modern dance and mime and his body is as expressive as the spoken words he speaks. Poetry in motion, a fusion of an epileptic fit, and.... Yes all that and more..... The long and short of it is that you will love the Skinny German Juggle Boy! 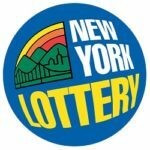 Hilby will be now performing at both the Sports Activity Center in front of the Toyota Coliseum and near the NYS Lottery Players Pavilion, see schedule to know where and when to find him starting on Monday, August 26. One of the most popular historic attractions at the State Fair is the Train-Railroad Exhibit behind the Horticulture Building. The exhibit is open and free throughout the Fair. 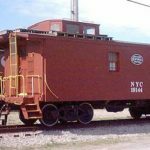 Visitors can relax in seated comfort in the restored vintage 1920s era passenger cars or browse through the classic 1916 model restored wooden New York Central caboose. These hidden gems look as they did when they first went on line, with authentic, original colors. Volunteers are on hand to answer questions while visitors can view the restored historic equipment. Experience the sights and smells of the spectacular arrangements of colorful plants and flowers. Visit the Taste NY Market where you can sample, purchase and learn about New York produce. Get up close and personal with a working bee colony and taste New York’s finest beverages. 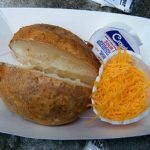 Check out the Potato Booth Restaurant where you can still get a large white or sweet potato with all the toppings for just $1.00. Use your taste buds to celebrate New York's traditional role as a gateway for immigrants and a melting pot of diverse cultures. Explore the Fair's renovated International Building and find specialties from around the world. Whether you crave Caribbean empanadas, German bratwurst, Japanese tempura, Greek baklava, vegan delicacies or some other ethnic dish, you'll find it here! Come learn about and celebrate the culture and heritage of the original New Yorkers at the Iroquois Indian Village. 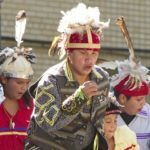 You can experience every day the traditional music, dance, crafts and customs of the Iroquois. This section of the Fairgrounds has been dedicated to Six Nations programs since 1928. Come see the new Turtle Mound, home of the traditional dances that take place three times daily at 11:00am, 4:00pm and 7:00pm. The mound has been built to resemble a turtle, an animal sacred to the Iroquois. The village also received new roofs on its buildings and other renovations this year. Look for the Kiddleland Midway location between the main midway and the New York Experience Festival Grounds! 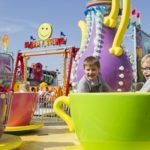 An area for the younger crowd, set apart from the main midway in which families can relax and let their little ones try age-appropriate rides without the noise and excitement of the busier, older crowds. Make no mistake this area is still filled with exciting rides, games and attractions! 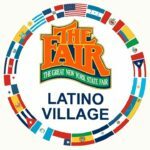 Latino Village, located at the New York Experience, is where the Fiesta is at! 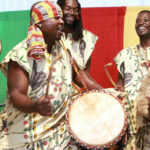 The Fair is providing the perfect platform for fair goers of all ages and beautiful colors to gather and enjoy a unique culturally infused experience. The Experience Stage is at the heart of Latino Village where you can catch some of the best entertainment with daily show times at 2, 4, 6, & 8. Food & Drink vendors will temp and satisfy your taste buds by providing Latino/Hispanic and other cuisine that are simply delicioso (delicious). 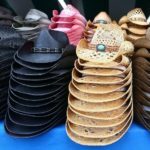 Vendors and Exhibitors offer quality goods, services, and resources. Latino Village will be held August 23-25 and will strive to make every visitor feel Bienvenido (Welcome). 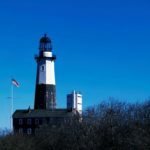 Visitors will be able to learn about the over 80 New York State lighthouses and lightships via a large interactive kiosk at the "Pathway through our Maritime History: Lighthouse & Lifesaving" exhibit coordinated by New York Sea Grant as part of the new Maritime History Showcase, located next to the pond at the New York Experience. The exhibit opens daily at 10:00am. The exhibit includes a series of interpretive panels highlighting life as a lighthouse keeper and the role woman played in the lighthouse service, you will see period uniforms and become familiar with the ever changing technology that has kept our shores lite for mariners throughout history. You will experience a boat building demonstration of a cedar kayak, go beneath our waters to lean about shipwrecks, and travel along our coasts to delve into the wars that formed our country. Lifesaving (boat safety) information, as well as remote sensing information via an in-water (pond) remote sensing buoy and underwater drone (ROV) demonstrations by the Great Lakes Research Consortium will occur in the retention pond throughout the fair. Be sure to visit the Dairy Cattle Barn's newly renovated milking parlor observation room where almost every day you can watch cows being milked and learn about milk's journey from moo to you! Closed on select days for dairy cattle change overs. Come enjoy the sweet tastes of maple syrup, maple cotton candy and other maple treats while learning about the fascinating and age old process that is used to make maple syrup. The Maple Center is located in the Horticulture Building. 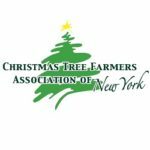 Let the New York State Christmas Tree Growers Association get you in the mood for the Christmas holidays. Christmas trees, wreaths, centerpieces and heart-shaped novelties compete for prizes on opening day of the Fair. There are wreath-making demonstrations daily in their location in front of the International Building. Maybe you’re attending the Fair for the first time. Maybe you’ve come here for decades. Chances are, there’s a lot about the Great New York State Fair that you don’t know. Be sure to stop in at the Grange building and wander through this exhibit with displays that tell the story of where the Fair began, where it traveled, who came to the Fair, who entertained at the Fair and much more from 1841 to the present... share your memories with us! Come in and see what programs the NYS Grange are involved with. In addition, enjoy performances on the Grange Stage by old-country party bands, line dancers, singers and lots and lots of cloggers. Literally, thousands of horses from across the Northeast and Canada come to the New York State Fair to compete in one of our many competitions. 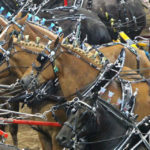 From Arabians to Quarter Horses and from the mighty Clydesdales to miniature horses, these shows highlight the rich heritage of our horse industry. Of course, who can forget the light and heavy horse pulls which will amaze and astonish everyone. Every day there is a new and different horse show to enjoy in the Toyota Coliseum. The Lottery Players Pavilion houses the Lottery’s expanded retail and prize payment operations throughout the duration of the Fair. The space is also used to showcase various programs sponsored by the New York State Lottery as part of the agency’s mission to support education. Located in the southeast corner of Coliseum, across from the Dairy Cattle Building. The New York State Police Exhibit, one of the most popular stops of the Fair, has moved to a new home near the Horticulture Building. 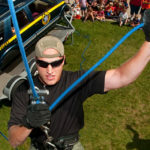 The area, which includes two buildings, has been renovated to include a new, steel tower Troopers will use for their daily demonstrations of building rappelling techniques. Inside one of the buildings, a log cabin, fairgoers can use a simulator that demonstrates the dangers of texting while driving and a forensic crime scene area, as well as a Wall of Honor to fallen Troopers and a place to sign up for the Trooper exam. State Police Canines will have a new, air conditioned place to rest between shows, and all the exciting demonstrations that fairgoers enjoy will return. The Hall of Veterinary Health is held every day from 10 am-5 pm. This is the largest public event that NYS Veterinary Medical Society holds every year to educate the public on veterinary medicine. This year’s new exhibit is on complementary veterinary medicine with information on acupuncture, chiropractic, herbal medicine and laser. The display includes informational panels and various examples of the tools used for these modalities. This exhibit joins the others: Lyme Disease/Rabies, Dentistry, Comparative Anatomy white boards, Dress Like a Surgeon, Teddy Bear ER, Journey Through Imaging and Preparing your Pet for a Vet Visit with new mock vet exam stations. Once again vet students will do the Build Your Own Stethoscope hands-on activity on the weekends. The Hall will also feature daily live presentations with animals ranging from reptiles to birds to mini ponies, as well as a daily first aid demonstration. This year we have several new presentations including honey bees and equine dentistry. For the daily live presentation schedule, click here. Located between the Center of Progress Building and the Wegmans Art and Home Center, you can come of the Pan-African Village to learn about New York's African-American history while you listen to music with African roots, taste African and Caribbean inspired food in the food court sponsored by Total Care, sip southern-style lemonade and browse booths filled with ethnic items. Click here to view the full entertainment schedule. In the Horticulture Building, the New York State Fair Potato Booth will still be the place to get your $1.00 white and sweet potatoes with all the toppings to eat!. 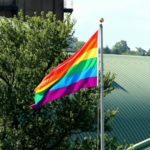 The only State Fair in the U.S. to host its own Pride Day, the annual all-day event on Friday, August 23 will include a flag raising ceremony, LGBT choirs and parade at 6:00pm. Come celebrate the culture, community and find more Special Fair Days here. The amazing sand sculpture will return to the Center of Progres Building. This year you can watch 180 tons of sand (that’s 360,000 pounds) sculpted into a work of art by the people from Team Sandtastic! Just remember it’s never too early to shop for the holidays and birthdays as you pursue the aisles and aisles of unique vendors in the Center of Progress Building, the Marketplace Pavilion Tent, or at any of the hundreds of other Fair vendors selling cowboy hats, leather goods, spas and hot tubs, and handcrafted items. The SkyRiver Butterfly exhibit in the Horticultural building of the New York State Fair is stunning! These Exotic Butterflies are from all over the world both domestic and overseas such as the Costa Rica's electric Blue Morpho, the wide-winged Paper Kite of Asia, the white spotted Postman of Africa and the Scarlet Mormon of the Philippines. 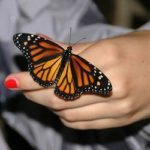 Upon entering the 70 foot exhibit, lined with blooming flowers, the fairgoer receives a feeding stick and the butterflies will land on your hand to feed off the nectar on the stick. Truly breath-taking. This exhibit also has a serious side, educating everyone on the need to protect the habitat of these delightful creatures if we want them for our children. The exhibit closes at 9:00 so make sure to see it before the end of your day. The best time is first thing in the morning when the butterflies are most active and best of all, admission is just $2.00. On each of our special days, be sure to line up at 6pm along our new parade route for our biggest parades yet! See marching bands, local organizations, and attractions themed towards each special day... a special guest Grand Marshal will lead the parade and unique giveaways will be given away each night. The parade route goes in front of the Center of Progress Building, past the State Park, winds around the International Building and continues down the new Broadway road along the new midway area! The Sports Activity Center is home to a variety of NYS competitive sports. 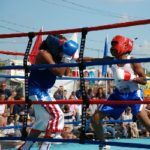 Girls and Boys Basketball clinics and tournaments, Westside Gymnastic Exhibition, Ray Rinaldi’s NYS State Championship Boxing, Wrestling Take Down Tournament, NYS Fair Wrestling Challenge, Moving Along Flyers Wheelchair Basketball Tournament , Arm Wrestling Tournament and for the first time there will also be a Pickle Ball Competition. Be sure to check out the schedule so you can be a spectator at your favorite sport. As a special added treat, see Hilby, the Skinny German Juggler perform his hilarious act several times every day. Located in front of the Toyota Coliseum. This year, when you pause right before the buildings open each day at 10:00am for “The Star Spangled Banner,” there’ll be a live voice singing it. The winners of our new competition to find talented singers for our daily national anthem will take the Chevy Court stage to start our uniquely American event the right way. S.T.E.A.M. stands for Science, Technology, Engineering, Arts and Mathematics. 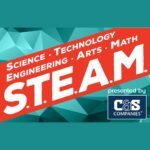 This new and interactive exhibit, sponsored by C&S Companies, will feature hands-on activities, workshops and demonstrations aimed at stimulating creativity in young fairgoers and encouraging them to consider careers in related fields. The exhibit will host a variety of organizations, including professional and student groups, higher education, museums, corporations and makers all with fun hands-on and educational activities. Stop by the exhibit in the Science & Industry Building and build a bridge, play giant Jenga, tryout some robotics or see the drones. New York State’s finest child, teen and adult performers sing and dance in the Fair’s version of “American Idol”. 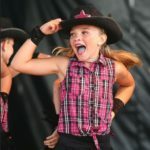 The performers - the winners of county fair competition across the state - take the stage daily in mornings and afternoons for a chance to compete in the finals over Labor Day weekend. Located outside the main entrance of the Youth Building. View a complete schedule of performances. 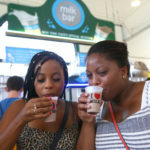 Last year, thousands of Fairgoers found brand-new favorite foods and drinks when they visited Taste NY. It’s back and even better than ever. Companies that make delicious products right here in New York State will return, offering free samples and products for sale. You’ll find all kinds of food and beverage items – salsas and spreads, snacks and desserts, wines, and so much more. Click here to view participating companies. 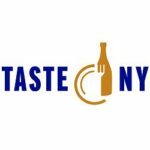 Taste NY is dedicated to providing a showcase for the best products grown and made in New York. 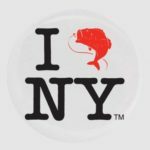 At events all across the state, Taste NY is spreading the word about the amazing quality of homegrown and homemade food and drink. Visit the Taste NY Market area inside the Horticulture Building, and browse through even more great products. Now TWO days! The 2019 Taste NY Food Truck Competition will be held on Saturday, August 31 and Sunday, September 1 from 10:00am – 7:00pm. Over 20 different trucks will assemble in the New York Experience area each day and sell $3 samples. Click here to view the food truck participates for each day. A phone number will be posted for you to text the name of your favorite truck and vote for the People’s Choice winner during the competition. Trucks will be selling 10 am – 10 pm, but the competition ends at 7pm so make sure to get your votes in before then! The Fair’s Wine Court has moved back to the Colonnade, the columned area between the Dairy Products and Science and Industry buildings. As always, the area will be filled with many of New York’s best wines, but it doesn’t end there. You’ll be able to get mixed drinks made with spirits distilled in New York, or a craft beer from the state’s ever-growing selection, or even a glass of hard cider. 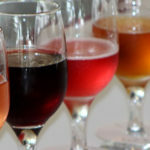 The Village provides a delicious demonstration of the amazing expansion of wines, spirits, craft beers, and ciders, all under the Taste NY brand. Collegiate teams and coaches from Morrisville, Cobleskill, SUNY ESF, and Paul Smith’s will participate in this year’s 3rd annual Timber Sports & Forestry Experience Day on Sunday, September 1 in the New York Experience Area. In addition to demonstrations by over 60 collegiate competitors, there will be demonstrations by professional timber sport athletes, a lumberjack exhibit, Hud-Son Forest Equipment, Wagner Lumber and an extensive forestry exhibit put on by Cornell Cooperative Extension of Onondaga County. 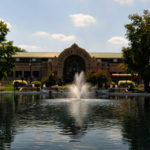 Located in front of the Horticulture Building, the Veterans Memorial held its opening at the 1999 Fair and was expanded in 2001. It features an eternal flame, flag poles with bricks of all the wars at its base and stones for each branch of the service with individual bricks placed from the service branches. The 9/11 Memorial honors all those that lost their lives in the September 11th terrorist attacks. 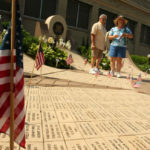 Unveiled at the 2002 Fair, the Memorial is located between the two phases of the Veterans Memorial. Make sure to attend Armed Forces Day ceremonies at 11:00am on Thursday, August 30 at the memorial. Join the State Fair community as we honor and give tribute to all our Veterans. 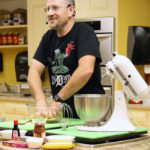 Plan to be at the Wegmans Taste NY Demonstration Kitchen in the Wegmans Art & Home Center. Experience the bounty of New York throughout the day as chefs from across the State hold cooking demonstrations and prepare dishes using mouthwatering, regional ingredients. The State Fair Wool Center is the home of statewide wool competitions and demonstrations. 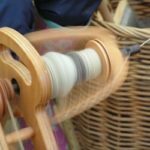 The center features old-fashioned wool-making, providing the fairgoer an opportunity to experience the proper preparation for market and/or hand spinning, and to show the various commercial grades as well as the best quality fleeces of the different breeds of sheep. See displays and demo’s on how other fibers can complement wool when blended and used... and make sure to play the "Guess the Fiber" game.